The Beled 1200 UV flatbed printer offers many great features at value not offered by others in the industry. With a wider print width of 1090mm and a media height thickness of 300mm, the Beled 1200 is truly a “game changing” UV printing solution. 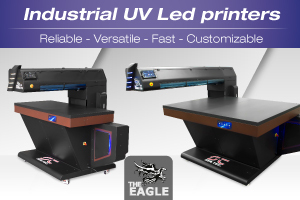 In addition, the Beled 1200 is packed with 14 industry leading features including dual third generation UV LED lamp arrays with liquid cooling system, WIMS (White Ink Management System for automated ink re-circulation and filtration. The Beled 1200 is a remarkable UV printer for anyone requiring high quality UV printing to virtually any substrate in the industrial decorations market. The Beled 1200 can print to virtually any substrate and was developed for use in promotional and industrial decoration market segments. This includes acrylics, plastic, ceramics, wood, metals, bottles and other substrates not mentioned. There are almost unlimited applications. Drying system: Water cooled UV Led lamps of third generation. Sincro print : Thanks to system you will be able to print white and color in one pass with significant speed advantage. IRS (Ink recirculation system) An innovative system allow the printer to increase performance thanks to a constant recirculation of white ink that avoid creation of sediment and clogging of the nozzles in the head after long periods of inactivity. PHPC ( Print Head Position Control ): The PHPC system produces uniform prints and assures that the head installed in the printer is protected, by constantly checking the position. 16 bit Rendering – Soft gradients without quality gaps.